I was handed over one AWS account at the root level by a business owner which runs different EC2 machines (staging/prod etc). What I want to do is simply create different IAM accounts that have restricted access. For example now I would like to create an IAM account that only has access to run, terminate a specific EC2 Instance. I basically followed instructions here. I created an IAM group (called superAdmin), and I created a new IAM account and I assigned a new user (user_1) to that group. it still doesn't work. Which means that accessing the console UI is a different service namespace than ec2. You are defining the policy based upon EC2 Instance ID. You need to add more permissions so that the user can display things like key pairs, volumes, instances, etc. There is a difference between assigning permissions to manage an EC2 instance from the command line, which can be very tight, versus the permissions needed to access the Amazon Management Console. Also, your policy has % characters. Is this actually in your policy or is this just there to show in your question? A better approach to controlling access to resources is to use Tags. For example to only allow user XYZ to access certain EC2 instances, tag the instances. Here is an example policy using tags. 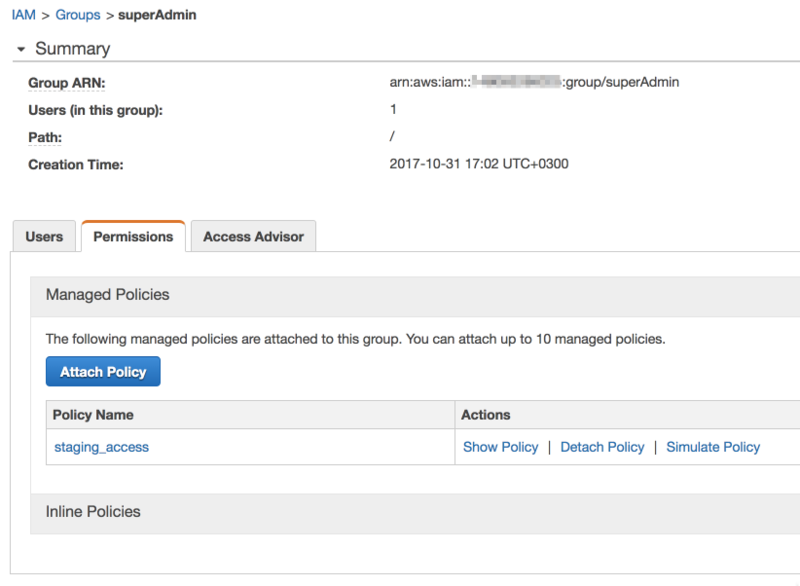 This policy allows the user to list all EC2 instances, but only allows all EC2 actions on instances tagged with their username. Not the answer you're looking for? Browse other questions tagged amazon-web-services permissions amazon-ami or ask your own question. Which IAM permissions are needed for ec2-create-image?